“I’m a First-Gen College Student” will bring together first-generation students, faculty, staff and recent alumni with Welcome Events from 4 to 6 p.m. Sept. 4 and from 11 a.m. to 1 p.m. Sept. 5 at Founders Memorial Library. To help launch the program, we’re telling just some of the many first-generation stories here at NIU. Not everyone in John Siblik’s family thought he should pursue art in college. The Lemont native started out majoring in computer science at Northern Illinois University. One drawing class his sophomore year and, “The rest is kind of history. I knew I was committed to study art from here on out. “I think my family inspired me with a certain kind of mental toughness that I grew up with,” said Siblik, the director of the School of Art and Design and an associate professor at NIU. The first in his family to go to college, Siblik switched to a double major of art education and fine arts, earning a Bachelor of Science in Art Education and a Bachelor of Fine Arts in 1988. His experience might not have matched with the opportunities his uncles and other family members saw for themselves, but college exposed Siblik to a wide range of fields of study. Through faculty, peers and visiting scholars, he gained access to a wealth of opportunities. An artist as well, his mother likely would have gone to college if her parents would have allowed her to study art. They were willing to pay for secretarial training. Siblik’s father managed grocery stores and, at that time, it was not always necessary to have a business degree to go into management. Siblik attended Joliet Catholic High School, which merged with St. Francis Academy to become Joliet Catholic Academy in 1990. Most of his classmates went to college after graduation. His family had agreed to a 50-50 deal, paying the tuition, while Siblik was expected to take out loans and whatever else he needed to pay the rest. A summer job in construction helped him cover books, art supplies and rent. While at NIU, Siblik said he gained confidence, learned to put himself out there. After graduating from NIU, Siblik established an art practice before starting a teaching career in 1990 and earning his master’s degree in fine arts from Southern Illinois University in 1995. “I wanted to prove to myself I would be able to continue making art without having the assignments I had from an instructor. That’s a big hurdle for some,” he said. 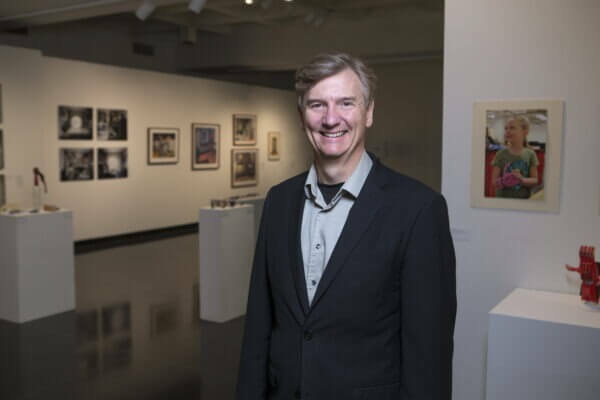 He taught for 21 years, before earning administrative positions at Upper Iowa University and returning to NIU in 2015 as director of the School of Art and Design. Siblik is accessible to students to let them know the path they need to take to be successful. He tries to be very open about the process. Teaching is more like giving the playbook away, Siblik said. For him, the path wasn’t always easy. He had a tough time learning to write in the different formats required of his various classes. He also remembers forgetting to study for a geology test and skipping it. The professor allowed him to take the test, and he did well. But he knew he simply was lucky. Finding a group of peers that can be a positive influence helps. “At a big university like this, it’s not that hard to do,” he said. “But it’s next to impossible if you try and go it alone. If you need help, please ask. In addition, you are going to have to know yourself, your strengths and weaknesses. Enjoy food, music and giveaways and hear stories about the personal experiences of those who were the first in their families to attend four-year colleges at Welcome Events on Sept. 4 and 5 at Founders Memorial Library. Learn about the resources available here, including the Breaking Barriers bi-weekly support group for first-generation college students, the Mentoring Valuable Peers program, future career events, supportive and accessible NIU policies, financial aid and scholarship information and more. Are you a first-generation faculty or staff member? Drop in to a Welcome Event and take home a laminated “I am a first gen college graduate” door decoration to put in your office. Let first-generation college students know they’re not alone and support is available.